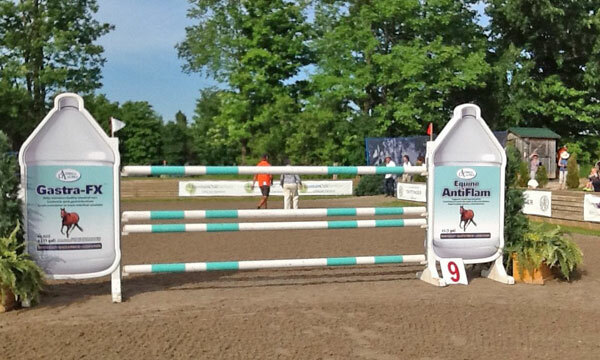 This week we will feature the $36,000 Nationwide FEI 2* 1.45m Grand Prix at Angelstone. Once again we are having perfect weather for this Saturday night grand prix. There is our usual good crowd on hand and everyone is early to watch the horseless jumping for the younger boys and girls. Mainly girls compete in the ring and the spectators really get behind this fun event. I don’t think it is the first time, but we had a local young man sing the national anthem and it was very well done. 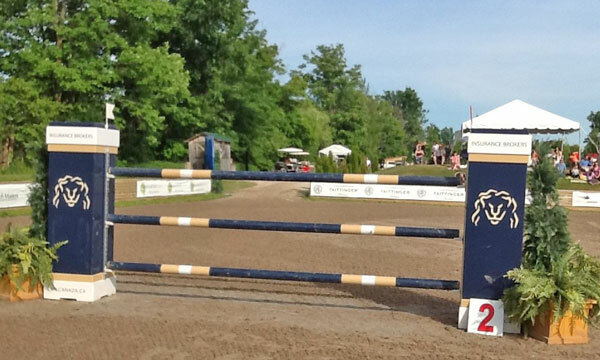 This comes from the WEF series in the winter and it is extremely well done in Wellington. I think this a great way to support talent in the local community. 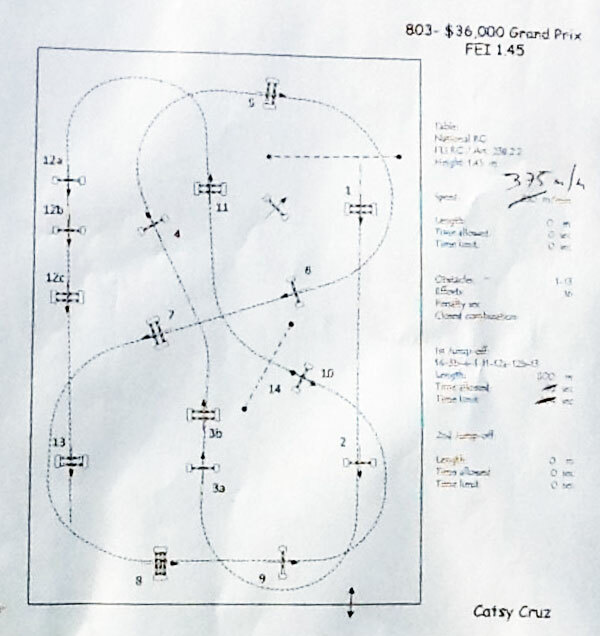 Our course designer for the week has been Catsy Cruz (MEX) and anyone who follows Course Discourse on Phelpssports during WEF in the winter will know that she is one of my favorite course designers. Catsy is one of the best we have in the business. She is here at Angestone for the first time and seeing her results from the open welcome, I expect a great class tonight. The class will feature 17 competitors and all will compete. On the course tonight we will see 13 numbered obstacles and 16 efforts. 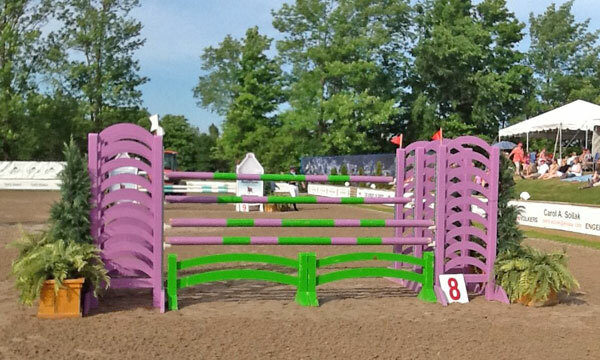 The course will feature one triple combination, one double combination, one Liverpool oxer and one triple bar. 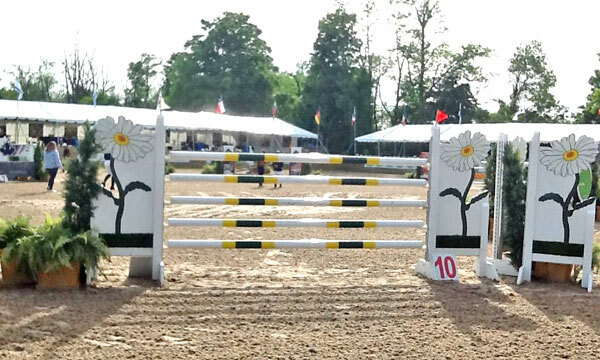 There will be no plank jump, no short pole vertical and no water jump (the ring does not support a water jump). The time allowed is set at 83 seconds and will not be changed. The speed for tonight’s class is 375m/m and last week we were at 350m/m. Last week I discussed the use of 10ft jumps and tonight we have the same set of jumps with 12 obstacles made up of the 10ft equipment and only four of the standard 12ft. 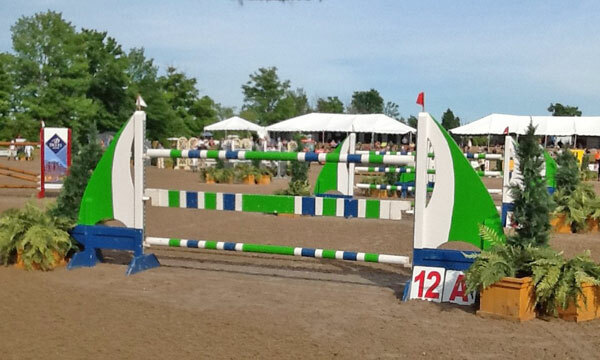 This is a test for the rider and their mounts, but it is a serious question for the course designer. 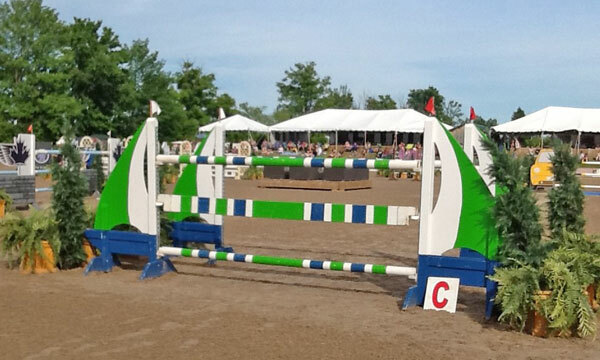 I am not a fan of this overload of 10ft jumps, but it is what it is. I would ask the readers to comment on the use of these jumps. 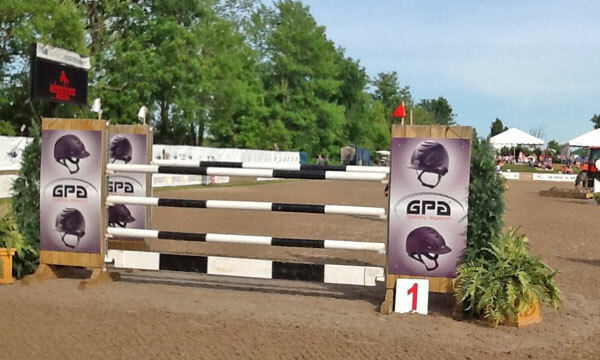 I think that we are now ready to walk the $36,000 Nationwide FEI 2* grand prix. #1 oxer 1.30/1.35/1.40m or 4.2/4.5/4.6ft starts the rider on the right rein and was soft enough that it was not faulted tonight. #2 vertical 1.40m or 4.6ft comes from #1 in a straight line with a distance of 39m or 128ft toward the in-gate and was never faulted. 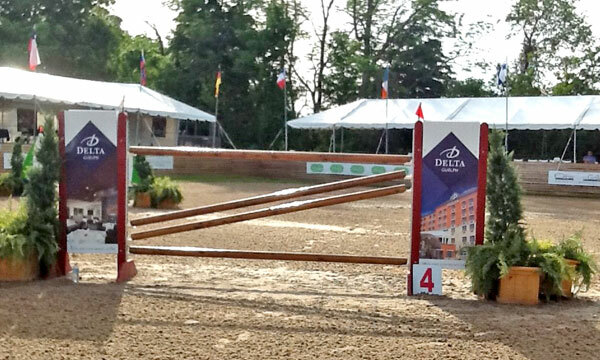 #3a vertical 1.40m or 4.6ft comes on the right rein back up the ring and was pushed to the floor two times. 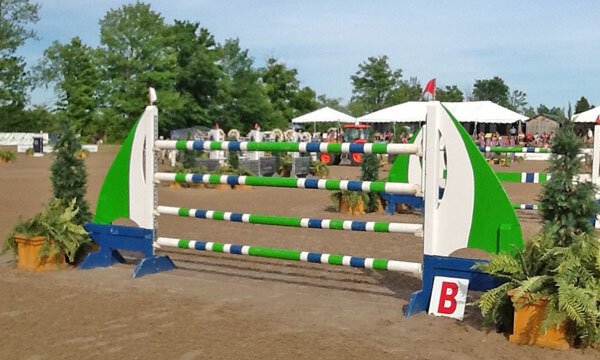 #3b oxer 1.40/1.50m or 4.6/5ft comes from #3a with a distance of 7.90m or 25.9ft and met mother earth four times. #4 vertical 1.45m or 4.9ft comes from #3b on a soft bending left rein with a distance of 29m or 95ft and was not faulted this evening. 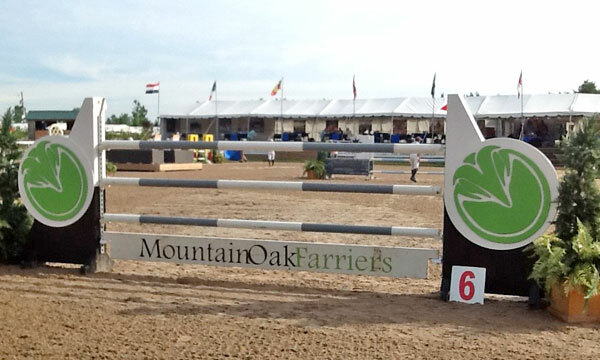 #5 oxer 1.40/1.50m or 4.6/5ft comes on the right turn with no distance given and was another jump to remain intact on the night. 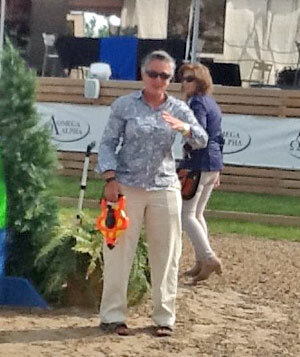 #6 vertical 1.45m or 4.9ft comes on the continuing right rein and right turn and played in the sand on three occasions. #7 oxer 1.42/1.50m or 4.7/5ft comes from #6 in a straight line with a distance of 22.50m or 73.9ft and received no punishment tonight. 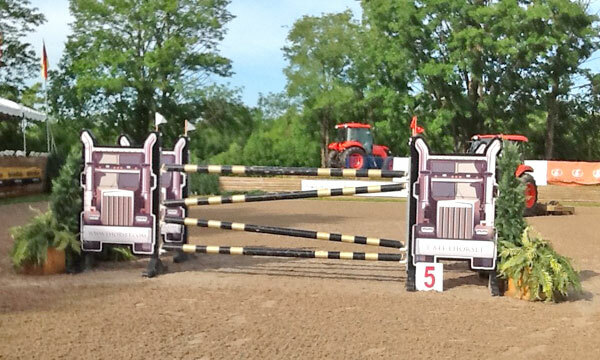 #8 triple bar 1.45/1.65m or 4.9/5.7ft comes from #7 on the left rein and turn and was not faulted tonight. 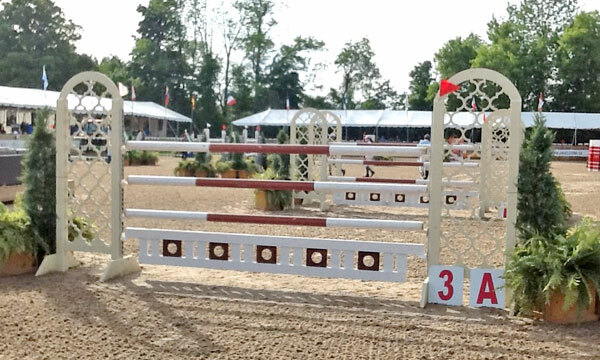 #9 vertical 1.45m or 4.9ft comes from #8 in a straight line with a distance of 18.30m or 60ft and is at the in-gate and tumbled from the white 20mm cups one time. #10 vertical 1.45m or 4.9ft comes from #9 on the continuing left rein away from the in-gate and found the artificial sand two times. #11 oxer 1.43/1.55m or 4.8/5.1ft comes on a soft bend on the right rein with a distance from #10 of 35m or 114.9ft and tumbled to the turf two times. 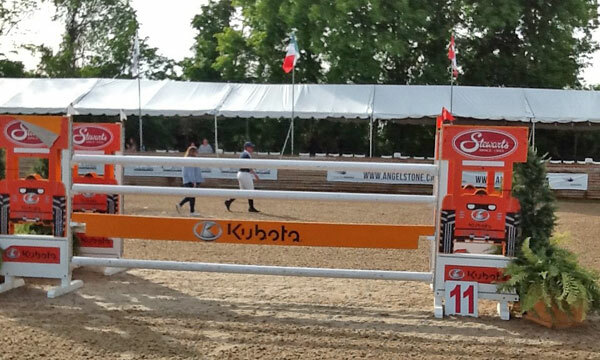 #12a vertical 1.43m or 4.8ft comes from #11 on the left rein and was lowered one time. #12b vertical 1.45 or 4.9ft comes from #12a with a distance of 8m or 26.3ft and found vertical relief two times. 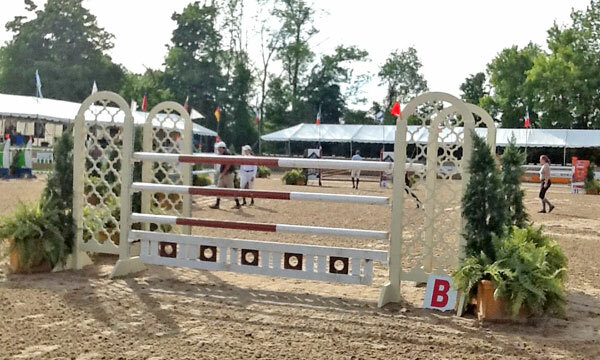 #12c oxer 1.43/1.50m or 4.8/5ft comes from #12b with a distance of 7.80m or 25.6ft and was also buried in the sand two times. 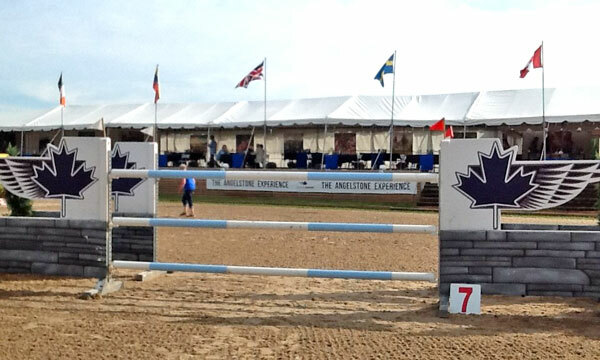 #13 oxer Liverpool 1.43/1.55m or 4.8/5.1ft comes from #12c in a straight line with a distance of 25.30m or 83ft and was the last fence in the first round and at this point we saw three poles fall from grace and we also had a fall and thus elimination of one rider. This could have been a bad fall, but both horse and rider were ok. The rider went on to be the eventual winner of tonight’s grand prix. The final tally of the first round will show that we had four clear rounds, three rounds of four faults, one with five faults, one with six, six with eight faults and one with 16 faults. There were no VW’s and there was one fall and with the fall-elimination. The time allowed was fair and should not have been a factor for anyone in the class tonight. The class was entertaining with great results after the first round and with a small number of entries and a very mixed field of competitors these results are a testament to the skill of the course designer. The use of the 10ft equipment did not make her job any easier. As I have stated, Catsy is one of my favourite course designers and she showed her skill at design tonight and I hope to see her again next year. 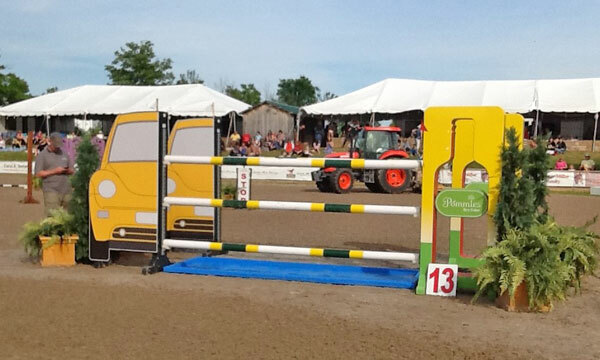 This will end the spring tour at Angelstone and with a week off we are back at Palgrave in 2 weeks. When a rider catches my attention, I think that I will take time to point them out and say congratulations on a job well done. For this week a shout goes out to Jessica Hunter, who has been doing very well of late and has been very consistent in the grand prix ring this year. Until next time, I am Dave Ballard.